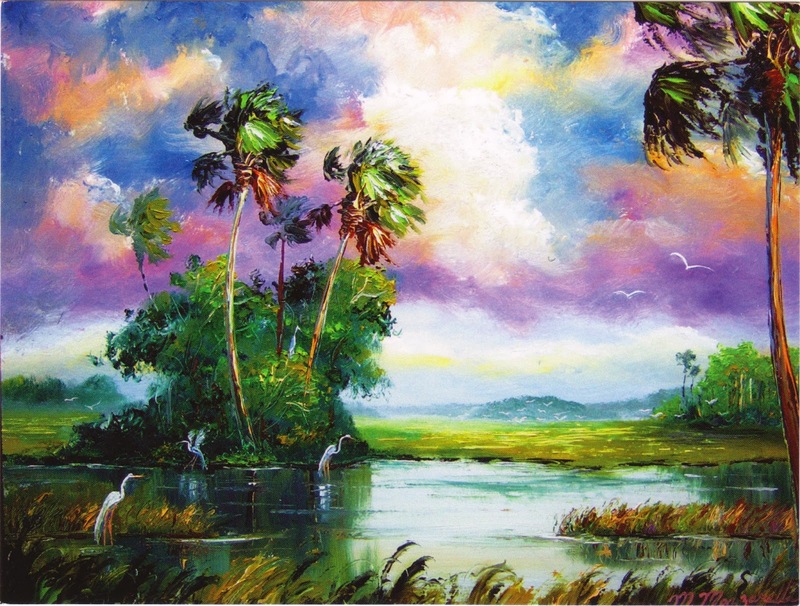 Postcard US-2651093 to Spain shows a colorful windy scene at the Everglades in Florida, from an original oil painting by Florida artist Mazz. The Everglades are a large wetland area in the South Florida, where the Kissimmee River flows into the vast but shallow Lake Okeechobee, then discharges into a 60-mile or 97-km wide and more than 100 mile or 160-km long swamp. The southward slow-moving water, as writer Marjory Stoneman Douglas described as "River of Grass", eventually reaches Florida Bay in the south. It is a complex inter-connected and inter-dependent eco-systems that include sawgrass marshes, freshwater lakes, cypress swamps, estuary forests, tropical hardwood hammocks, pine rockland, and marine . Since Congress formed the Central and Southern Florida Flood Control Project in 1947, the metropolitan areas in South Florida have grown substantially and near 50% of the original Everglades has been developed to farmlands or urban areas. There have been increased environmental awareness since UNESCO designated the Everglades as one of only three wetland areas of global importance in the 1970s. Restoration began in the 1980s and the Comprehensive Everglades Restoration Plan (CERP), a plan to restore the Everglades, was approved by Congress in 2000. The postcard can be purchased at Zazzle and the original oil painting can be purchased at ArtistGalleria.com.